← Step Away From The Take-Out Menu And Nobody Gets Hurt. Roll call! Who is still committed to those Healthy & Strong resolutions they made this year? By now all of that vim and vigor might be starting to wane. I mean… we’re in the middle of a Polar Vortex, here! How can we be expected to pull off anything beyond basic survival? But you know what? I’m not going to let you forget your Resolution! Not this time! THIS IS YOUR YEAR! If I can lose 100 lbs in a year, you can accomplish any resolution. 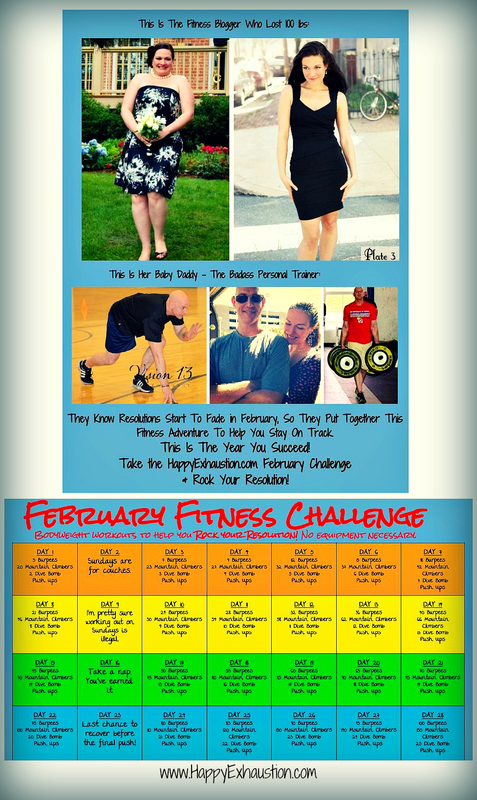 To help you stay on track, the resident trainer and I put together a February Challenge. You can follow along on the calendar below, or join us over at the Happy Exhaustion Facebook page where I will be posting daily workouts and providing support and encouragement to anyone who wants to participate. This is your chance to recommit! Grab that resolution with both hands and do not give up. You can move mountains – but only if you do the work. Earn your strength. Make yourself proud. You deserve it. Save it, Pin it, Sweat it out!